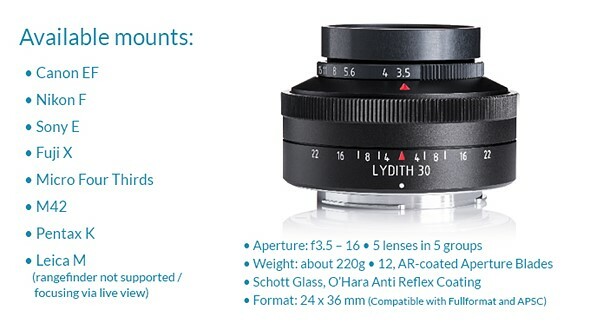 German optical manufacturer Meyer-Optik-Gorlitz has launched a Kickstarter campaign to help it reintroduce its Lydith 30mm F3.5 lens. The original lens was launched in 1964 and the forthcoming version will remain true to the basic design of five elements in five groups, but the new company will be updating a number of its features. Meyer will use Schott glass, modern coatings and a 12-bladed iris instead of the 10 of the original lens. The modern Meyer Optik trades on the interesting ‘bubble’ bokeh of its Trioplan lenses and has gone to some lengths to ensure bokeh is equally exciting to the eye in its modern relaunched lenses. The Lydith will offer a closest focusing distance of just 16cm/8in, which is approximately half that of the 1964 lens, and although the company hasn’t said specifically it is likely that it will have a click-less aperture ring as well. The standard price of this manual focus lens on the Kickstarter page is $749, though some early bird offers were left at the time of writing. The earliest shipping date is December 2017, with the main batch going out in February 2018. For more information about the company see the Meyer-Optik-Gorlitz website or the Lydith 30mm F3.5 Kickstarter page. One of the widest lenses in the Meyer-Optik lineup, the Lydith will impress you with its versatility at all distances. 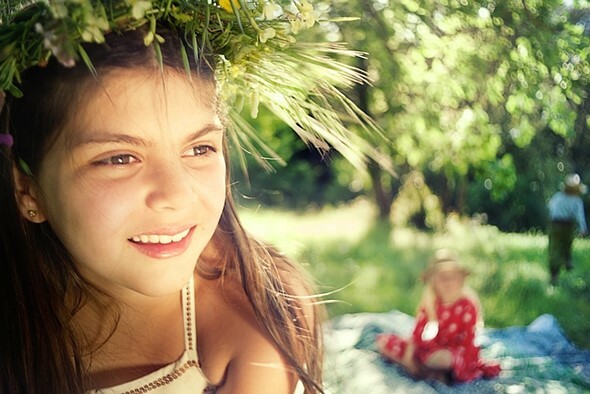 Exceptional sharpness, contrast and colour fidelity and it's wonderful ability to create images with that indefinable magic is how this lens can best be described. 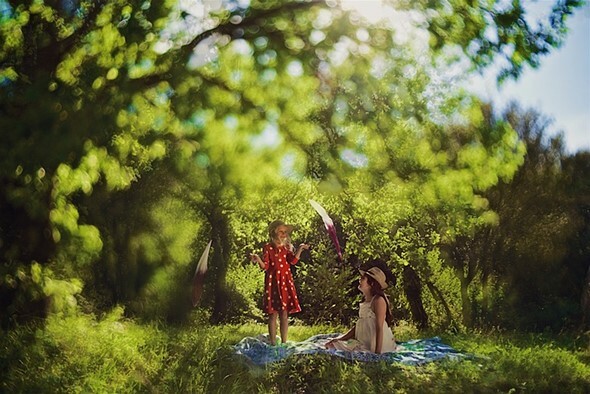 It is a lens that will allow you to creatively capture those "magic moments". Designed in the late 1950s and introduced in 1964, the modern version of the Lydith will be updated with high-perfomance lens coatings and a short minimum focusing distance of 8 inches (16 cm). 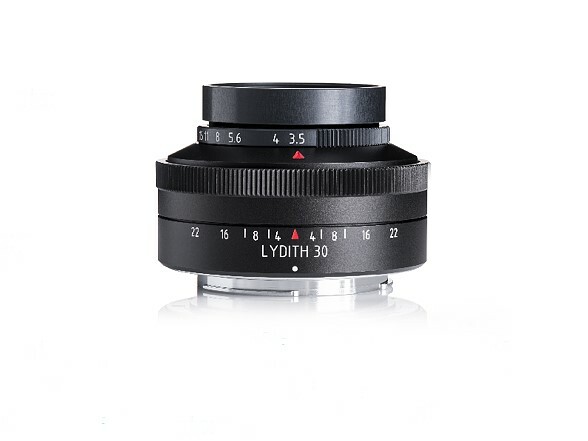 Like all of Meyer-Optik's lenses, the Lydith will be fully manual, 100 percent handmade in Germany. We think you are going to fall in love with the way it renders colors, its exceptional sharpness and, of course, it's signature creamy bokeh not only in the background but also in the front. Don't miss out - visit our Kickstarter now and be one of the first in the world to own the modern version of this classic lens. YUCK! That hurts my eyes. the effect of the lens has the photo-stacking of DoF look, which is interesting. Not surprising from the country that gave the world Dieselgate, which now started a new chapter of frauds last week. Probably a bad example, because an original 60/70s Strat would be worth thousands and an old Lydia is not a very exciting or valuable lens. The amount of R&D that some people are putting into developing new weird bokeh effects is downright impressive. So no R+D, but it's priced like it had the same R+D as a modern complex zoom? I'm sure that tens of thousands of dollars of the Kickstarter money are going into the pockets of whoever spent hours / days / months resurrecting and testing that 50 year old design, though. Either way, my point is, they had to be smoking some pretty weird stuff to think to themselves "yup, that's exactly the 'look' we're going for!" Nah, what you're seeing is the hipsterization of the photo industry. If you make something look cool and grassroots in the marketing, the hipsters will buy in. It's simple. Here: vintage look, manual, grassroots appears via funding, marketing. All the elements are here for the hipster scum and yet another area of life they are ruining for everyone else. Aside from how many thousands of dollars get wasted on these things, that could go to a better cause like charity or something, I don't feel like hipsters are "ruining" anything. I would definitely buy that. Love that swirling bokeh effect. If it was 10 times cheaper. I would rather stick with my Helios 44-2 with my metabones speedbooster on my Fuji X camera. I have no idea what this lens will cost. A real Lydith, or its twin Pentacon (in fine shape) cost around $30. Then it is M42 of course. It is two rather common lenses, easy to find. The picture of the lens above looks a bit narrow att the front lens. Lydith has a rather large one. Maybe an optical illusion. Or ... the photo above is not the actual Lydith copy. BTW - the zebra Lydith is a real beauty. What adaptor do you need for a EF mount? Is there any danger of hiting the mirror of a fullframe? Don't know, not really my thing. I like expensive lenses to actually be good. But there are M42 versions which I know that you can mount. I guess you can always go back to reminding the teens to stop cutting across your lawn? I have the Pentacon-version of this lense and use it on my Olympus E-410. Very happy with it, especially when shooting B+W. Gives a nice atmosphere to the pictures. The fact that this lense will be re-introduced is fine for me. German optics are not dead ! Do you need an adapter to use this lens? Yes, for my Olympus I use a M42 to Four Thirds adapter. These kind of Pentacon-lenses all have M42-mount. All the grinding of teeth in the comments about the cost...or the qualities. Don't worry so much. You don't have to spend a fortune to try it. Wait for a while. Lensrentals will get it, you can try it for a weekend and send it back. You had some fun with a unique tool, and you didn't break the bank to do it. Problem solved. Nah, just spend enough time rooting around in the neighbourhood garbage cans and you'll likely come up with a few of the original Meyer Optiks. Really, you'll need to go to garage sales and pawn shops and part with at least a tenner for the privilege. Not sure what the problem is with companies producing modern versions of old lenses with character, or why people are whining about it. They're for creative use and lots of people will enjoy using them, they might need to have a rethink on the pricing though. ..but you are whinging about the price. LOL! No, a DPR whinge goes like this "If they don't lower the price I'm going to have to kill myself", or "I can't afford it, why did they do this to me? ", I made suggestion, check a dictionary if you're not sure. Don't forget the usual power vocabulary you read from the marketing and photography experts here: the price is obscene. What an absurd price. It's criminal. It's in Leica territory. How can they justify it? But we are spared one topic that causes orgasmic outbursts of frothing: this lens should cover"full frame." I don't see why Dpreview places this on their website. I don't think it's good for their website. it's a lens.. a lens you put on a camera, that could be a digital camera..
What do you mean? It generates a lot of hate traffic. Here I am enjoying some of the funniest comments. This is a website about photography. I visit it to get to know things to help me make better pictures, in any way. I estimate that people buying this lens don't use it very much, if ever. The just buy it because they want it. It should be in an ad in Hourse and Hound Magazine or somethong like that. I've seen quite a few photographers in the field, both amateurs and pro's. 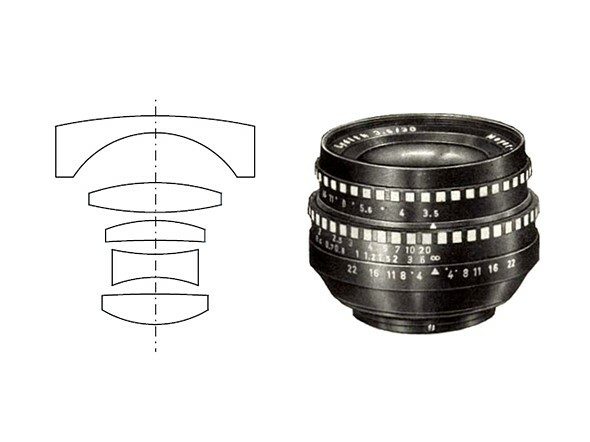 By the numbers of them using these kind of lenses - zero - I draw a few conclusions, yes. But when I guess it will be dry in the Atacama desert today, you will definetely say there is no reason at all to predict such nonsense. I've never seen anyone else using a Sigma camera like me, never, yet I know Sigma sells them, they must do because they keep making them, unless I bought the only ones they ever made, in which case I'm flattered they make them just for me. I really don't "get" this current fad in Germany to reintroduce mildly modenised versions of mediocre, slow, antique lenses, such as this Lydith and the Leica 28 Summaron. I could understand it if they reintoduced modern versions of the sought after lenses, like the 8 element 35mm Summicron of the early 1960's and the 85mm/f1.5 Summarex, one of the world's all time great portrait lenses. It all rather smacks of trying to separate a fool and his money and is thus a very cynical exercise. it's because the optics industry in Germany is failing, too, and they know how to entice the hipster scum into buying garbage lenses by making it cool. Riiiiiighhhht makes sense. Sounds like a typical DPR non-photographer. It's a mystery to me how this company can stay in the market. Do many people really buy these sh..., I mean, lenses for outrageous prices? Short run specialty lens = higher price point. It's like a recreation of a vintage car. It may not work nearly as well as the average new car, but people are still willing to pay high premiums for them. Vintage cars are vintage, these are made in 2017. Anyway, it's pointless to me, you may have a different idea. My parents did not have fancy cameras in the 50s or 60s, but their optics were miles ahead of this lens. I really don't see the point of it, all the more reading in the comments that its from (yet another) dodgy CN supplier flogging "Western" brand names. Im not sure if this lens is like mine (Praktica 29mm 3.5) that was made in seventies by Pentacon (Democratic East Germany about 40 years ago). the lens is not very sharp as it has some flare so i think the new coating will help. There was a later Pentacon branded version (still 30mm f3.5), and there was also a Pentacon 29mm – a different lens. I had a Lydith in the 1970s for my first SLR (an M42 screw mount Mamiya). It was my first wideangle lens, the only one I could afford at the time (it was the restyled “mk 2” version with fine ribbing on the grips). Although it was cheap it was some time before I found a better lens. Performance held up well against the light, it was much better than the Praktica 29mm lenses. The 29mm was F2.8 based on the Orestegon 29mm F2.8. Later the brand was renamed to Pentacon and when Praktica introduced a bayonet mount they were called Pentacon Prakticar. It is less sharp than the Lydith 30 3.5 but renders nicely. Your conversion is correct of course, but just for info the Kickstarter page gives an MFD of 16 cm. I enjoy shooting old and quirky lenses myself. Quirks are fun, they add character, they make your images different. But it is still important to realize that for the most part those quirks are imperfections of the earlier day optics. They are there, because at the time it wasn't possible to get rid of them. For example, hazy and "dreamy" look wasn't a feature - it was an artifact caused by the low contrast, glare, etc. That's why it really makes me cringe when I see modern "recreations" of those imperfect lenses with price tags like 700 or 800 bucks. That's the price of a contemporary high-precision and high-complexity piece of optics. You can get a chinese CCTV lens with swirly bubble-bokeh, low contrast and glare for just about 30 bucks and adapt it to your camera for another 5 or so. That's the justified price, because it's the crappy lens. And by today's standards Lydith is just as crappy. Fun, sure, but still crappy. And it's not worth $750 - not in a long shot. Not a chance. I do completely agree with you, however this lens is mainly a toy or a collection item. I doubt anyone will be using it in professional work, or as a main lens in a holiday. That said, if it were priced $250 i still wouldn't buy it (and probably you wouldn't either) and it will still be a crappy lens compared with what you can get today for $250. But as a nice looking, carefully crafted recreation of a, more or less, historical lens it will have it's appeal as a collection item or as a nice toy for a lot of people. But it takes high precision to consistently recreate all those old school imperfections, aka 'character'. :-D If someone accidentally got a 'perfect' copy, well, then something went wrong (or actually right!) during the manufacturing process. You took the words out of my mouth, I have a whole collection of "quirky" and "characterful" lenses. Legacy lenses, CCTV, Cine, machine vision etc. And all of them combined cost less than this thing. It was only as budget lens in it's heyday! I never used this lens in real life so maybe I'm unfit to comment (but I'm doing anyway), but I don't see the appeal of the images this lens takes. It just looks so weird to me. How is it not good to have options? What's next a new Domiplan? I think the next lens is a $1000 single-element lens. The Meyer Optik Daguerreoplan 64mm/f14. Be careful with the decimal there. It's definitely f/14, not f/1.4. Antique design, result a blurry mess. Why, in this day and age when you can buy cheap lenses or good ones with all the advantages of modern ED glass, aspherics, in-camera correction would someone spend money on that thing? And I would buy this over the cheaper Voigtlander Nokton 35mm f/1.4 because..? ...you like how the images look? Halleluiah, a depth of field scale. I can't understand why this feature is not mandatory on all primes. It was once. How difficult can it be? How difficult can it be to use a lens that doesn't have a DOF scale? F4, click, review. Not enough? F8, click, review. People who don't use or don't know anything about hyperfocal distance or zone focusing, well, they can't really appreciate the value of having lens markings on the barrel. For them, they should stick to their modern design AF conveniences and let the camera decide DOF automatically. For those of us who actually shoot by setting things manually on the lens (or camera) before bringing the camera to our eyes, and don't need to chimp afterwards because what we carefully planned and framed before in our minds was deliberately captured, we welcome manufacturers making contemporary lenses with lens markings. Good point. Most photographers I run into these days don't know what pre-focusing is, or why the dof scale makes a huge difference. I believe AF is the culprit and encourage everyone I meet to get at least 1 manual lens and play around some. Don't you actually learn the DOF properties after you've played with the lens a few times? I don't get it. It's never been an issue for me,,, but I'm sure I'm doing it wrong. Educate me, oh wise ones. For landscape photography having a depth of field scale is really really handy, as most of times you should use hyperfocal. True that on a modern dense sensor it may not be precise, but you have at least a reference: I usually use the reference of one or two stop more open: so when I am shooting at f/16 I use scales for f/11 or even f/8. I don't know any other way to truly have full control over depth of field. Focus peaking (EVF, OVF) totally nerfed that DoF thingy. Hyperfocal distance method is worst for landscape. Instead use a centuries old method, today known as merklinger method. It is only way to get all in focus. Please do not judge a book by its cover. We're not supposed to judge a lens by the output it creates? cover = its physical appearance, e.g. the build of the lens itself. Of course you are supposed to judge it by its results, but that's not the cover. More like fussy bokeh that demands your attention... and if you fight the urge, look away, and tune it out... make you feel like you're on meds. I tend to agree. I am sure there are great photos from this lens design, the ones provided don't seem to be great examples. why not? you calculate the value of a lens by its aperture? @kreislauf: not calculating the value based on its aperture, but on its features. A big aperture might be one, AF might be another, for me automatic aperture is important (not having to darken the viewfinder to meter), and last but not least image quality. To make an example a ford T might be funny to drive, but I don't think anyone would buy one for something like 40000$. Yes it is "too much" for me as well. But there is such a thing as a premium that some will pay for a rare lens. Think Leica. On the other hand there were literal millions of Helios-44 lenses made. This was and is a quite capable lens but because it is not rare the price is at give-away levels. Obviously rare and not-rare affect price. And those that try and judge a lens by its street price can be bamboozled by trying to use this as a yard-stick for capability. If you want a rare Lydith remake then you have your chance right now. If you want a relatively common original Lydith or one of the several very similar lenses made in its day - then go buy one now at a much more affordable price. If you don't like what a Lydith might do well it might be useful to save "breath" and energy and buy the lens that suits one's purpose. But to say that you might buy one for "$100" but don't like what it does is a complete contradiction of thought process. @Tom Caldwell: "Obviously rare and not-rare affect price." There's a saying in the gun-collecting world - "Rare junk is still junk." Someone please enlighten me on this statement "it's signature creamy bokeh not only in the background but also in the front". OOF areas can exist in front of the chosen subject. I guess I don't get it. That first picture looks like poor photoshop bokeh simulation, with the right side looking like bad use of the cloning tool, to boot. Well, that bokeh is "special" alright; it shows more of the lens defects I discuss in my cameras as computing systems course than any other single image I've seen. I will admit, however, that the close-up images look a lot better... so it was smart for them to let it focus closer. You will not see me buying one of these. It took me a second to realize what's going on in the first image. The bokeh looks odd and photoshopped, as you say, because there is a tree branch(es) out-of-focus in the near forgound. This combined with the bokeh in the distance creates a pretty interesting image (in this case) actually - making it look like the kids are in some kind of portal. I realized this after they pointed out foreground out-of-focus in the article which made me look again. Thank you, I couldn't understand why the effect was asymmetrical! "In der Fachpresse wurde immer wieder angemerkt, dass es sich bei den angebotenen Objektiven (mit Ausnahme des Trioplan) nicht um Eigenentwicklungen handle, sondern um Rebrandings. So verbergen sich hinter den beiden Nocturnus-Linsen sowie hinter den Figmentum-Linsen „Mitakon“-Objektive der chinesischen Zhongyi Optics-Gruppe. Auch das Somnium 85 mm sei eigentlich ein russisches Helios 40-2. Auf Nachfrage bestätigte ein Sprecher von Meyer-Optik die „Verwandtschaft“ der Objektive, betonte jedoch deutliche Qualitätsunterschiede, da die Objektive von Meyer-Optik in Deutschland teilmontiert und aufwändig justiert würden." This is quite hysterical. The company has already been panned for rebraning Mitakon and lenses from Chinese factories. Then they charge exhorbitant prices. I have no knowledge of this company but it seems to me that some start-ups are unscrupulously taking advantage of mythical "German engineering" and "hand made" labels to justify charging enormous premiums. Let's see if it actually does what they say. @BobT3218 Only the market justifies what is an *enormous* premium. If the consumer can be convinced to pay, then the price is fair. This company is a complete joke in Germany, by the way. Agreed. I really don't see a market for a single one of their lenses at their prices. At least Leica has an actual following, and quality glass. These Meyer lenses are gimmicks that can be re-created by buying old, slow vintage glass for cheap on ebay. So who is actually buying these lenses up to meet their kickstarter goals? Meyer were the third largest German lens manufacturer and had a good reputation as lens builders. Somehow the Cold War propaganda meant that their reputation suffered somewhat. At least their lenses were not well known outside the Soviet block. That the later designs did not translate as well via Pentacon's tender hands did not help. However at least "New Meyer" is not undercutting the street price of the standard "original issue" lenses like Zenit has done for the re-issued Helios 40-2. If there is anything hysterical on the general tenor of these posts it is the reaction of the unknowing about the unknown. Leica lenses of couse are always "safe". My little (original) Lydith and the several very similar lenses made and sold by other even lesser known German brands is not nearly as bad a lens as popular opinion might have it. This company is hysterical and a perfect example of the disaster eastern Germany still is. Please maintain a professional demeanor, avoiding vulgarity and boorishness. To do less is to degrade the reputation of DPReview. Cool, I guess? Doesn't the old version sell for like 50 bucks? DOF scale, where are the indications on the distance ring ?? without those nformations, the diaphragm indication is useless ? OK,, so the modern version is made by currently underpaid German workers. I don't get the whole wringing of hands over the DOF scale thing,, I use a digital camera,,, like most folk,,, once I've shot a lens a few times,, I get used to it's optical properties and unique character. Who needs a DOF scale? Not trying to be funny,, I honestly don't get it.